Our youngest home party hostess extraordinaire Katie Boyden showcased Nomi Network to her family, friends and the Bethany Covenant Church community as part of her senior project. For her project, Katie is exploring the issue of human trafficking and how to make a positive impact. Katie attends Bedford High School as well as the Manchester School Of Technology, where she is studying careers in education. This dedicated community activist and advocate also enjoys working at St. Marie’s Childcare Center. She loves to hang out with her friends and watch movies. We are excited to have Katie join our efforts and share our mission and our eco-friendly products with her family and friends! NN: Why did you want to get involved through a home party? KB: I thought it was best fit for me, and the best way I can use my resources to help. There were walk-a-thons and bigger fundraisers, but I like more intimate settings than huge stages. I like talking to people one on one. NN: How did you hear about Nomi? KB: I googled it and googled key words. NN: Tell us about your party. How many people attended? Did you have it with a different event? KB: 40 people showed up and it was a good mix of young and old people. More adults than kids were present. Most of the people were mom’s friends and parents. NN: What was the structure of the event? KB: I had the slide show of the event going and different laptops going to watch the Nomi promo video. I had people walking around and advertising the products and had people volunteer to make the food. NN: What was the most popular item? 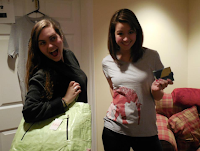 KB: Elephant shirts and the fruit wallets. A woman said the fruit wallet was different and was a great way to start the conversation. NN: Did people purchase these items as gifts? KB: A lot of people bought the items for themselves. Moms bought items for their daughters. NN: Why do you think your guests responded so positively to the mission and products? KB: Nomi has great products, but also hearing about these causes touches people’s heart and they want to do anything to help. NN: What was your favorite part of the home party? KB: Seeing people excited about the stuff and people who were willing to make donations who didn’t buy anything and people caring about the cause. NN: If you had any advice, what would it be to others who want to throw a home party? KB: I would invite people ahead of time and made a facebook page which helps get the word out. Plan in advance. NN: Please tell us more about your senior project? KB: The senior project is supposed to take you roughly a year of working on it and the application was the home party. It needs to be outside of what you normally do. I have normally been involved with causes and raising awareness about human trafficking. At the end of the year we have a presentation so it’s a great way to raise awareness. NN: What did you learn from this experience? KB: I learned it was a huge issue and many people didn’t know about it. I had pamphlets around with information from websites to share with people and people came up and asked me questions. NN: Do you plan on staying involved with anti-trafficking efforts after?